This year I had the chance to catch up with Andy Gillentine and Jack Holt, cofounders of Whit.li, to see what had happened since the Whit.li API was released. It allowed to check compatibility of two people based on the analysis of their social media profiles, and the target companies to use this service where collaborative consumption sites like AirBnB. The talks with the participants then and the follow up meetings taught them that the people who were really interested were brands, advertising and media companies. They wanted to understand more deeply who are the people engaging with their brand. The Whit.li team also learned that implementing an API is very difficult for large companies, because of their decision making process. 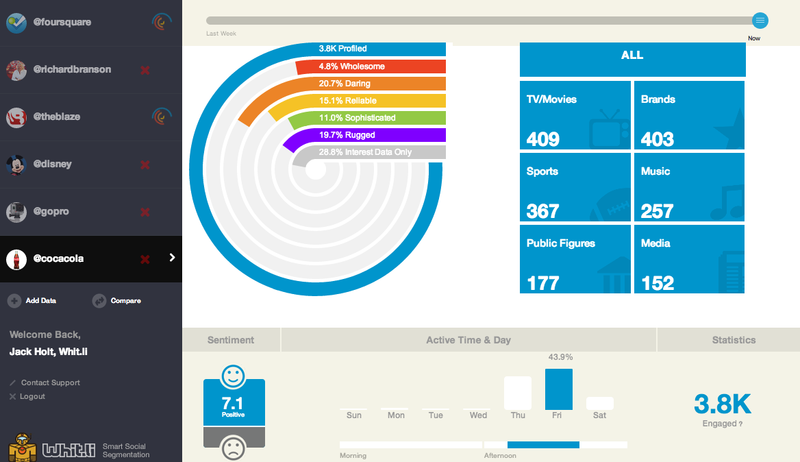 So they decided to build a marketing application that uses social data to do market research for companies. So they decided to change the product based on the technology they had already developed and they now segment the followers of brands based on five personality traits (Daring, Sophisticated, Wholesome, Rugged, and Reliable) and add information about each character, for example the TV shows that they like. This is where the magic of Whit.li is: you have a personality segmentation that allows you to tailor the advertising placement and content based on the personality of your target audience, not just their age, gender, education, etc. I’m sick and tired of getting absurd advertisements about cars and sports of which I could not care less (among many others), while I may be even receptive to the ads if they are more daring and funny, not just based on old missconceptions about gender. So I look forward to this kind of innovations that focus on me to give me a better experience. Media planners, market researches, and product developers are the people that will use Whit.li and we all will, hopefuly, be receiving better advertising based on the tool, and with it more useful information. The tool allows them to see an evolution, not just a picture in a particular time. 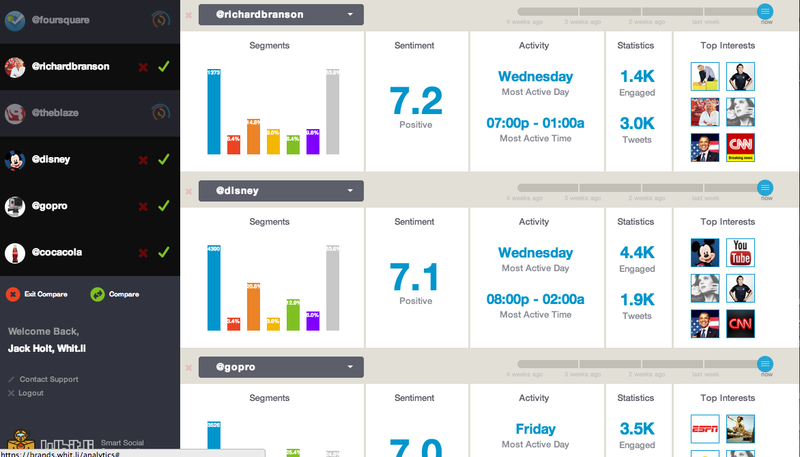 Compared to other tools like Radian6 , Whit.li tells you about your followers, not just what they are saying about you. You can also track the effectiveness of your campaign by seing if you’ve managed to grow the character trait of your followers. All the analysis is based on your Twitter interactions, and it needs to have at least to have 5000 followers. After all the changes done by Facebook, they are able to do a lot less than last year, but applications will work. This platform risk is not something that they are scared of with Twitter, but it could always come. For SXSW they have released at the brand application, where you can see the segments of followers of your brand and your competitors. Subscribe to my channel for more tech startup & collaborative working videos.